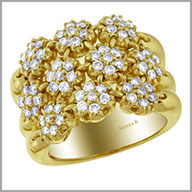 This ring is crafted in your choice of polished 14K white or yellow gold. It features 70 full round cut diamonds in prong settings. The diamond clusters resemble sparkling blooms to highlight your feminine side. The best part of this design is that it is beautiful as it is comfortable.